Molded fiber trays have gained a wide preference in the food and beverages packaging industry as they are sustainable, biodegradable, and eco-friendly. Made from newsprint, corrugated boxes, or other plant fibers, molded fiber or molded pulp trays are gaining traction as an environmental-friendly packaging of consumer durables and electronics items, healthcare products, automotive and mechanical parts, and a range of food such as fruits and eggs. On account of their excellent protection and the ease of handling, molded fibers are extensively used for providing edge protection to goods in the transportation and logistics industry. A burgeoning e-commerce retail in a number of industrialized countries is a notable trend catalyzing the demand for molded fiber trays. The demand for molded fibers trays in several packaging applications is also attributed to their flexibility to mold into any shape and size and their environmental friendliness, along with the factor that they are less expensive than most plastics packaging. In addition, their versatility of packing light as well as heavy, non-fragile items has bolstered their demand. The global molded fiber trays market is estimated to be valued at US$1,777.0 Mn by 2017 end and is forecast to reach a worth of US$2,422.8 Mn by 2022 end. The market is projected to rise at a CAGR of 6.4% from 2017 to 2022. Based on pulp type, the various segments of the molded fiber trays are transfer molded, thick wall, thermoformed fiber, and processed pulp. Of these, the transfer molded pulp type segment leads the market holding a share of 54.3% in 2017 or US$965.4 Mn of the market. Expanding at a CAGR of 6.9% during 2017–2022, the segment is anticipated to be worth US$1,346.9 Mn by 2022 end. The segment is projected to witness an annual growth of US$76.3 Mn during the forecast timeline and this growth in absolute terms is more than that of any other segment. The wide prevalence of this type of molded fiber trays is attributed to an excellent product finish and their substantial demand in packaging a variety of electronic equipment and household items. Typically being thin-walled relative to other pulp types, transfer molded fiber trays find wide use in the packaging of delicate and light-weight items. The growth of molded fiber trays is observed in regions such as Latin America, North America, the Middle East and Africa, Europe, Asia Pacific excluding Japan, and Japan. Of these, the Europe molded fiber trays market currently leads the global market and is forecast to hold the dominant share, vis-à-vis revenue, throughout the forecast period. The regional market is projected to expand at a CAGR of 6.6% during 2017–2022 and is anticipated to account for an absolute opportunity of US$231.2 Mn during this period. North America is anticipated to emerge as a prominent market for molded fiber trays in the coming years. A robust food processing industry and a burgeoning modern trade store for packed food items in various parts of North America are notable factors expected to accentuate the regional market. Rising at a CAGR of 5.1% from 2017 to 2022, the North America market is predicted to be worth US$ 492.9 Mn by the end of the forecast period. The regional market is forecast to be valued at US$ 384.6 Mn by 2017 end. Leading players profiled in the report are Brødrene Hartmann A/S, UFP Technologies, Inc., Huhtamaki, Oyj, Henry Molded Products, Inc., Pactiv LLC, Fibercel Packaging LLC, Orcon Industries Corporation, and Vernacare Limited. Prominent packaging companies operating in the market are expanding their production capabilities and entering into partnerships in major regions, in order to gain a competitive edge over other players. The global molded fiber trays market report offers a detailed assessment of the market dynamics, size and share of various segments, notable trends affecting the growth, lucrative avenues, key strategies adopted by key players, and the competitive landscape. The report evaluates the key factors driving prominent segments. It further takes a closer look at recent advancements in processing and manufacturing technologies in various regions. Taking a critical look at the market sizing of various segments over the historical period (2012–2017), the research employs analytical tools to arrive at reliable projection along the forecast period (2017–2022). The study tracks major developments in end-use industries and their impact on product demand. It also offers a detailed overview of supply chain and raw materials sourcing strategy and highlights the prevalent cost structure and pricing strategies. The report findings will guide market players to devise impactful strategies for their growth. 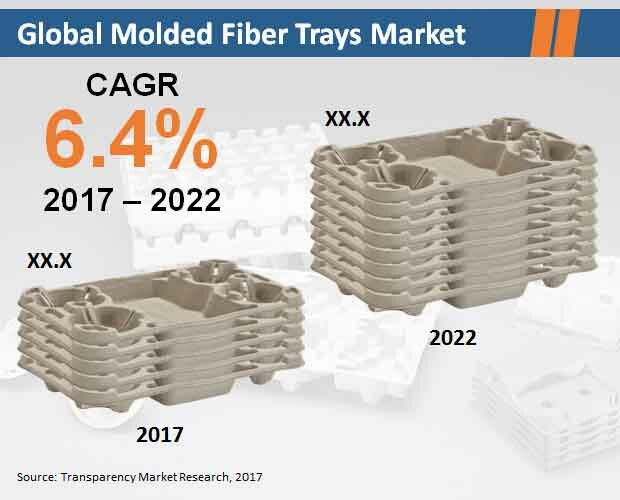 The global molded fiber trays market was valued at US$1,777.0 Mn in 2017 and is projected to reach a valuation of US$2,422.8 Mn by the end of 2022. The market is anticipated to register a CAGR of 6.4% during 2017–2022. The report offers a comprehensive overview of various factors affecting the growth of the market. The market dynamics covers notable drivers and major restraining factors, prominent opportunities, recent advancements in processing technology, and imminent investment pockets in various regions. The analysis also covers a detailed profiling of leading players and key strategies adopted by them to gain a stronghold in the market. The wide demand for molded fiber trays in various packaging applications is driven by their sustainability, biodegradability, cost-effectiveness and versatility. The burgeoning demand for molded fiber tray packaging in the transportation and logistics industry is mainly attributed to several advantages such as durability, ease of handling, and superior protection. They are also witnessing prevalent demand in the food and beverages packaging industry as they can be made to fit any product size and enhances shelf-life by protecting food against hot and humid conditions. Constant advancements in processing methods and equipment and the growth of numerous end-use industries are key trends expected to open up lucrative avenues for market players in various regions. The report broadly segments the global molded fiber trays market on the basis of molded pulp type, end use, and region. Based on molded pulp type, the report further segments the market into transfer molded, thick wall, thermoformed fiber, and processed pulp. Of these, the segment of transfer molded leads holding the major share of 54.3% in 2017. The segment is foretold to grow at the leading annual growth estimated at US$76.3 Mn from 2017 to 2022. On the basis of end use, the report further divides the market into consumer durables and electronics, food and beverages packaging, automotive and mechanical parts packaging, transportation and logistics packaging, food service disposables packaging, and others. The food and beverages segment can be further segmented into egg, wine, frozen food, and vegetables. Based on region, the report segments the global molded fiber trays market into Latin America, North America, the Middle East and Africa, Europe, Asia Pacific excluding Japan (APEJ), and Japan. Of these, currently Europe is the most attractive market and is predicted to dominate the global landscape by holding the major revenue share throughout the forecast period. In this section, the report offers a detailed profiling of key market players, emerging, and new entrants. The analysis highlights the key strategies adopted by them to gain a better foothold in the market or to consolidate their shares. Leading players discussed in this report include Brødrene Hartmann A/S, UFP Technologies, Inc., Huhtamaki, Oyj, Henry Molded Products, Inc., Pactiv LLC, Fibercel Packaging LLC, Orcon Industries Corporation, and Vernacare Limited.